1. What is the Super URL Tool and why should I use it? When you browse through products on Amazon, you’ve probably noticed that the URL in your search bar becomes a long and complicated string of letters and numbers. This is Amazon’s way of learning more about each listing, including which keywords are most relevant to customers searching for the product, which items are closely related to the product, etc. When you create a Super URL for your product, you take control of the information that Amazon receives from the URL. Creating a Super URL with the Amazon Super URL tool is easy – all you have to do is enter a short slug and decide on the keywords that you want to target, and we’ll create a customized short link for you. When this link is clicked, it will expand into a full URL that leads straight to your listing and signals to Amazon that the keywords you entered are very relevant to your product. The power of the Super URL is unleashed when you send quality traffic to your listing from your Super URL. When this traffic converts into paying customers, Amazon gets the message that your product deserves to be ranked higher when someone searches for your targeted keywords. As this happens, you’ll see your rankings start to climb and you’ll start to sell even more! To learn more about how the Super URL tool works and to see it in action in a video walk-through, please click here. Again, both Super URLs and standard Amazon URLs will lead people to the same place – your product listing. But when customers access your listing from a Super URL, Amazon learns about the top keywords that relate to your product, and they are more likely to adjust your rankings accordingly. So use these links anywhere it makes sense! The Amazon Super URL tool is great to use with all REAL incoming traffic, especially from the sources we mention above. But your Super URL shouldn’t be abused. If you click your Super URL again and again, or if you send fake traffic or bots to the link, you’ll just end up with a lot of non-converting traffic that will destroy your conversion rate and hurt you overall. Super URLs can be a great tool, but it’s important that you use them responsibly! Click on the “Super URLs” tab in the left sidebar. Click on the blue “Add Super URL” button at the top of the page. You will get a popup. Choose a product you’ve already added from another tool. Create a slug for your new Super URL. Remember that the slug is just a unique identifier for your URL that won’t have any effect on rankings. If you’re unsure of what to use as a slug, please see our quick guide about Super URL slugs. If you’re an Amazon affiliate, enter your Amazon Associates Tag. Note: this step is NOT necessary for most sellers. Only enter your Merchant ID here if you are one of multiple sellers selling your product. If you’re not sure how to find your Merchant ID, please follow our guide here: correct Merchant ID number. If you entered your Merchant ID, please double check that you entered it correctly by clicking the “Check Merchant ID” button. When you click “Check Merchant ID”, your product will open to your Amazon listing in a new window where you can make sure that you entered the correct Merchant ID. If the Merchant ID is correct, then you product will show with you in the buy box. If you have this incorrect, the product will show as ‘Not Available’. Click on the “Keywords” tab. Check the boxes next to the keywords you would like to use. We recommend selecting just a few keywords here. Using too many will make the tool less effective. It is very easy to edit your targeted keywords after creating your Super URL, so you don’t need to put too much thought into this step! You can also enter any other keywords into the box on the right. Click the blue ‘Save’ button. The finished Super URL will now appear beside the product. If you wish to create another, maybe with a different set of keywords, or just a different slug for tracking purposes, then repeat the process from Step 2. 5. What should I use as a “slug” for my Super URL? A: A slug is the part of a URL (Web page address) which identifies a page using human-readable keywords. It is usually the end part of the URL, which can be interpreted as the name of the resource, similar to the basename in a filename or the title of a page. The name is based on the use of the word slugin the news media to indicate a short name given to an article for internal use. You really can use anything you like as a slug for your Super URL as long as it’s unique. The slug has no effect on rankings – it’s just something you enter to make your link functional, unique, and identifiable to you. It does not have to include a keyword. Something such as “sample321” or “i-like-cats” will work just fine. If you receive an error message saying that the slug you tried is already in use, simply try creating another one. We recommend selecting multiple keywords for your Super URL, but we also know that you value certain keywords more than others. To help find the right balance between using several keywords and having one or two that you want to be used more often, we let you assign “weights” to your keywords. This lets you set the ratio of how often each keyword is used relative to the others. For example, if you want your Super URL to use Keyword “A” four times more often than Keywords “B” and “C”, you could give Keyword “A” a weight of 4 and give Keywords “B” and “C” a weight of 1. In this example, for every 6 times the Super URL is clicked, on average it will use Keyword “A” 4 times and Keywords “B” and “C” once each. To assign weight to your keywords, simply click on the product you want to edit and then double click the number in the “Weight” column next to each keyword. From the Super URL tab click on the ‘arrow’ beside the product image. This will then display your keywords for that product. Under the ‘Weight’ column click on the number to edit the weight. 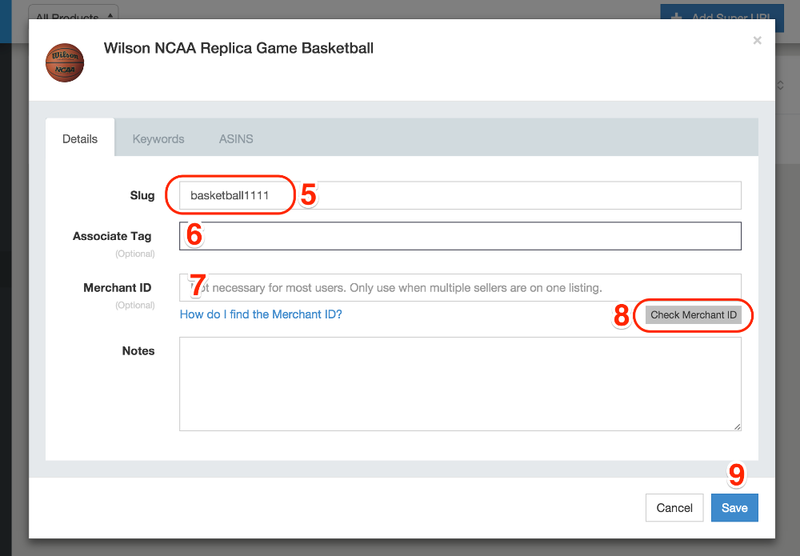 Enter a new number between 1-10, where 10 is the highest weight and will make that keyword appear more often. 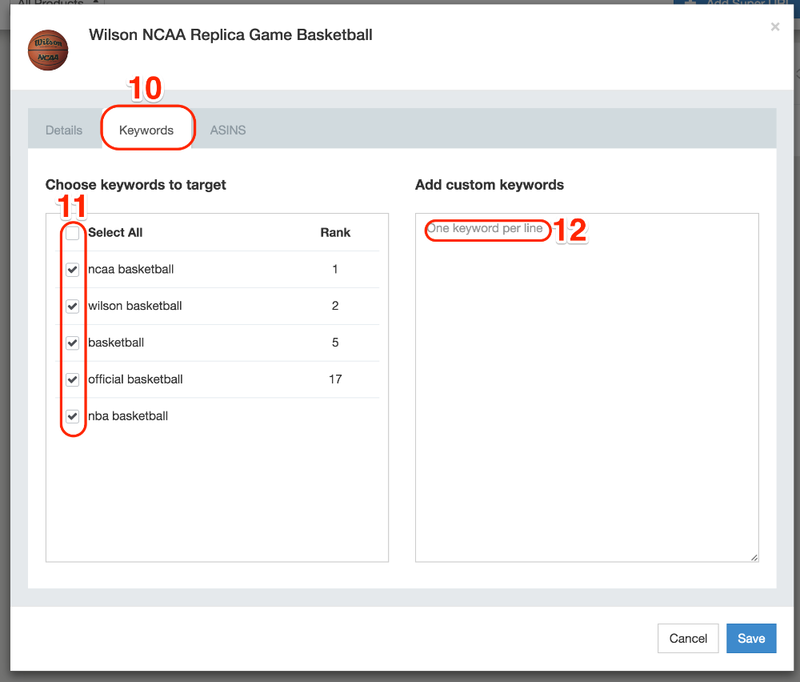 Repeat step 2 & 3 for each keyword weight you want to change. Click on the ‘edit’ icon beside the URL link. From the popup window click ‘Save’. Your keyword weights should now be changed. You can create and use your Super URLs in many places however we don’t allow Super URLs to be used in conjunction with Deals Community promotions.